Seattle is growing fast and our commu nity is no exception. 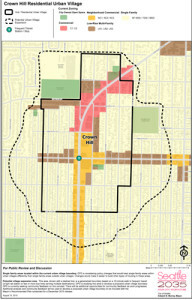 The City is proposing to center most of Seattle’s future growth in the Urban Villages, including our neighborhood, Crown Hill Urban Village. If you live between 22nd Ave NW and Dibble Ave NW, South of 95th St. and North of 76th St, your home is likely within the proposed expanded Crown Hill Urban Village and is currently slated to be upzoned to multifamily within the next two years. How can we encourage smart growth in areas that are already zoned for growth but underutilized (pink, yellow and brown on this map), instead of upzoning or expanding the Urban Village boundaries? 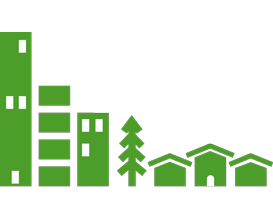 The Crown Hill Urban Village Committee for Smart Growth invites you to join your neighbors on Tuesday, July 26th from 6:00 – 7:45 pm in the Greenwood Library with guest and City Planner Geoff Wentlandt from Seattle’s Office of Planning and Community Development. At the meeting we’ll learn more about urban villages, what they might look like, and how we as community members can influence the growth of our neighborhood, the Crown Hill Urban Village. Crown Hill Urban Village Committee for Smart Growth is encouraging the city to engage in neighborhood planning to guide smart growth in our community that will include building density along our arterials first. Come join us to learn what is possible for our Urban Village, and bring your questions, ideas or examples of what you would like our Crown Hill Urban Village community to become as we grow.